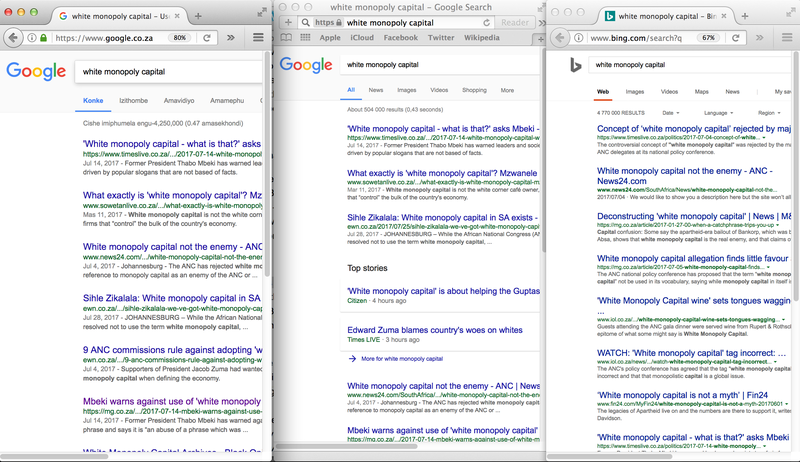 Exactly a year ago I did a mini-experiment to see whether search engine bias exist in South Africa as well. It did. 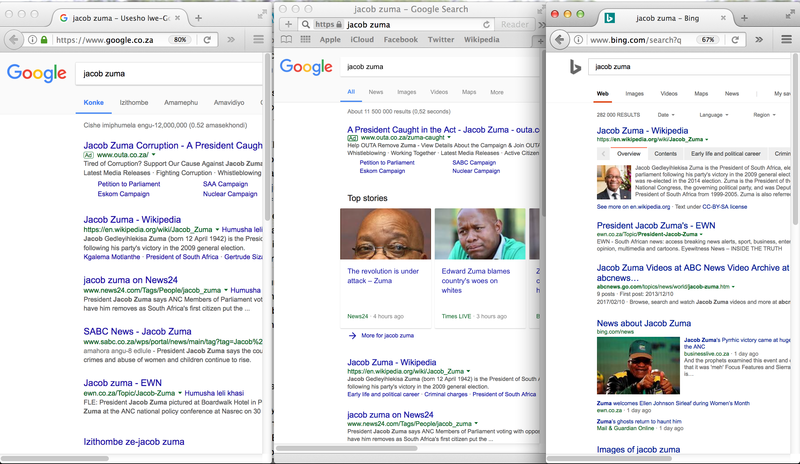 The notable case was that Google in English on Safari on the Mac (GES) showed results for ‘politically interesting searches’ that had less information and was leaning to the right-side of the political spectrum in a way that raised cause for concern, as compared to Google in isiZulu in Firefox (GiF) and Bing in English in Firefox (BEF). I repeated the experiment in the exact same way, with some of the same queries and a few more new ones that take into account current affairs; the only difference being using my Internet connection at home rather than at work. The same problem still exists, sometimes quite dramatically. 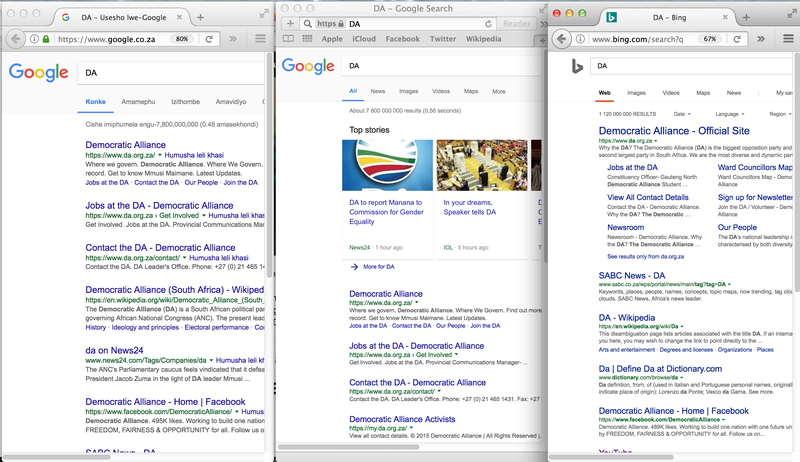 As recommendation, then: don’t use Google in English on Safari on the Mac unless you want to be in an “anti-government Democratic Alliance as centre-of-the-world” bubble. 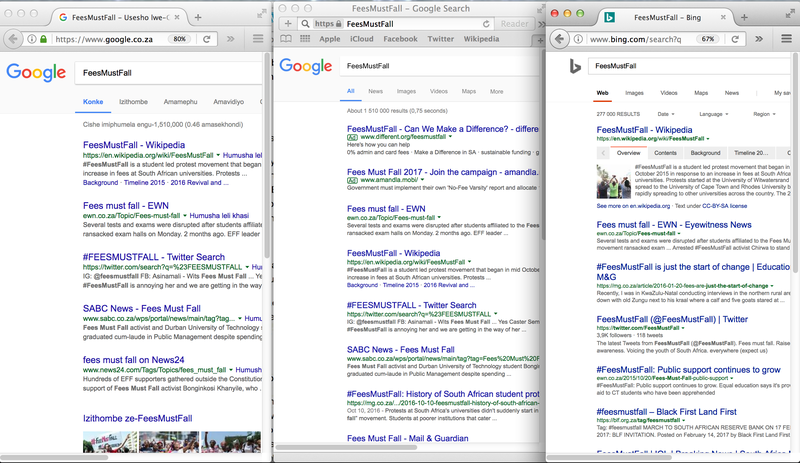 To back it all up, I took screenshots again, with the order fltr GiF, GES, BEF, so you can check for yourself what users with different configurations see on the first page of the search results. The set of clearly different/biased results are listed first. GiF lists it as political party; GES in relation to the DA first and then as political party; BEF as political party and electronic frontier foundation. blaming the whites (probably fuelling racial divisiveness), then general info and news; BEF has general info and news. 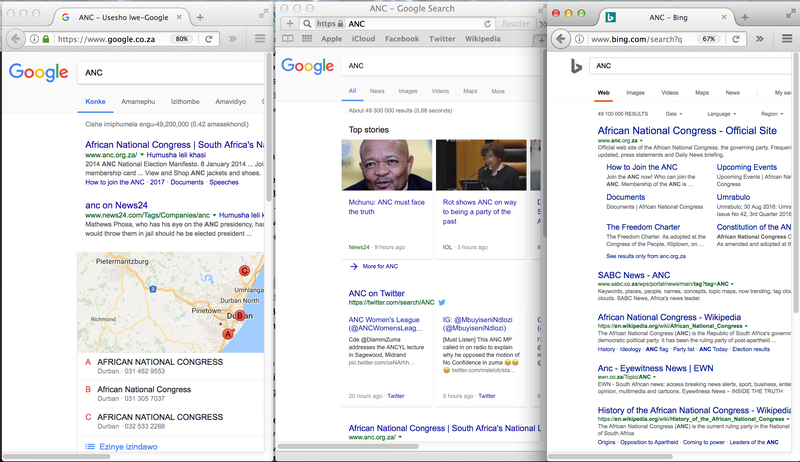 news, and for the rest contact info; GES has first ‘bad press’ for the ANC as top stories, then twitter, then the ANC website; BEF lists first the ANC site, then news and info. 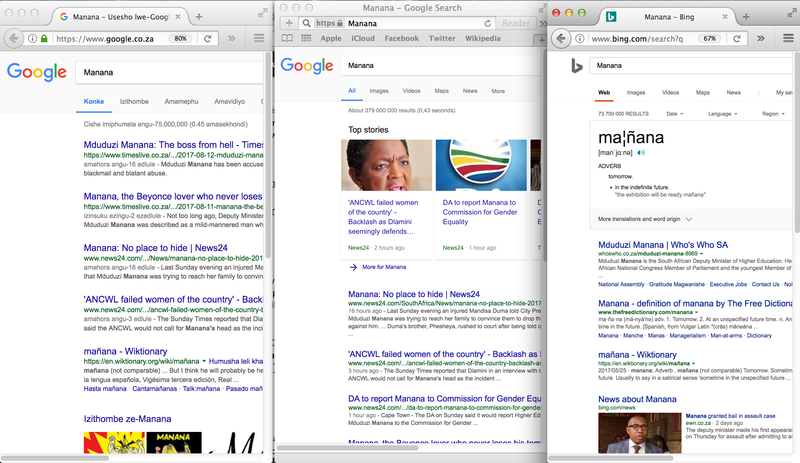 staff members in his department: GiF with news about the accusations; GES has negative news about the ANC women’s league and DA actions; BEF shows info about Manana and mixed it up with the Spanish mañana. 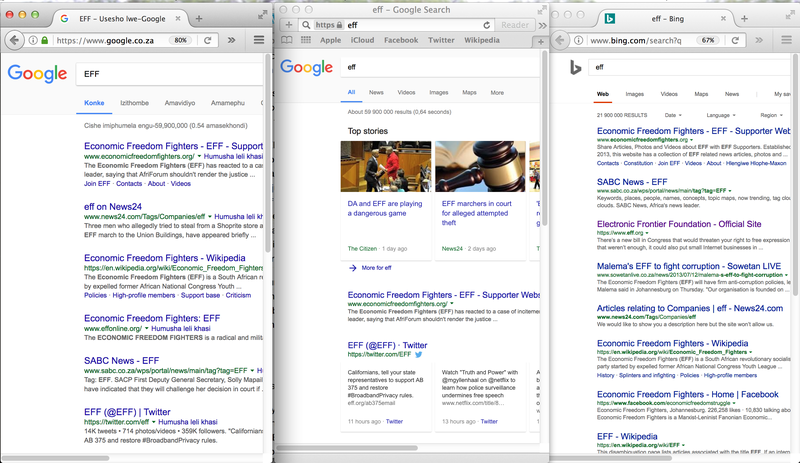 GES doesn’t have ‘eff news’ to suggest, so autocomplete also seems to be determined by the client-side configuration; BEF has all sorts of things. and news, but with that inciting blaming the whites news item; BEF shows general info and news as well, but differently ordered from Google’s result. (capitalist, for the rich): GiF lists the DA website and some news; GES shows news on DA action and opinion, then the DA website; BEF lists the DA site, some general info and disambiguation. 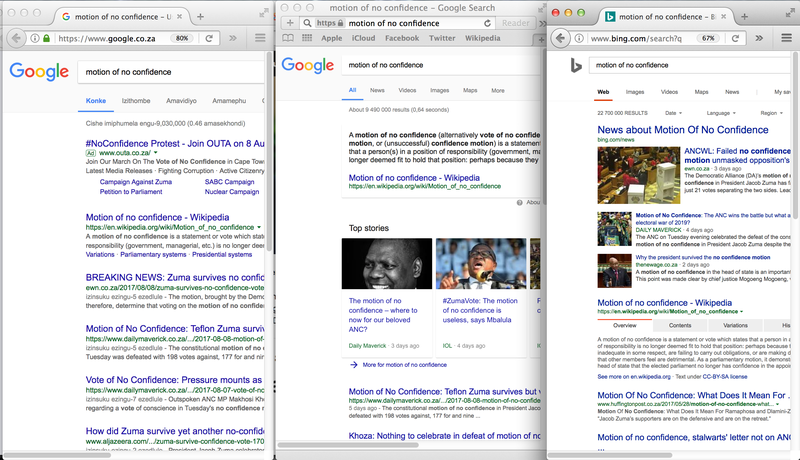 (the motion failed, but not by a large margin): GiF has again that Google ad for the organization to oust Zuma, then info and mostly news (with 1 international news site [Al Jazeera]); GES has info then SA opinion pieces rather than news; BEF has news and info. and 2016 (for free higher education): GiF has general info and news; GES shows first two ads to join the campaign, then general info and news; BEF has info and news. So, this seems flipped cf. last year. 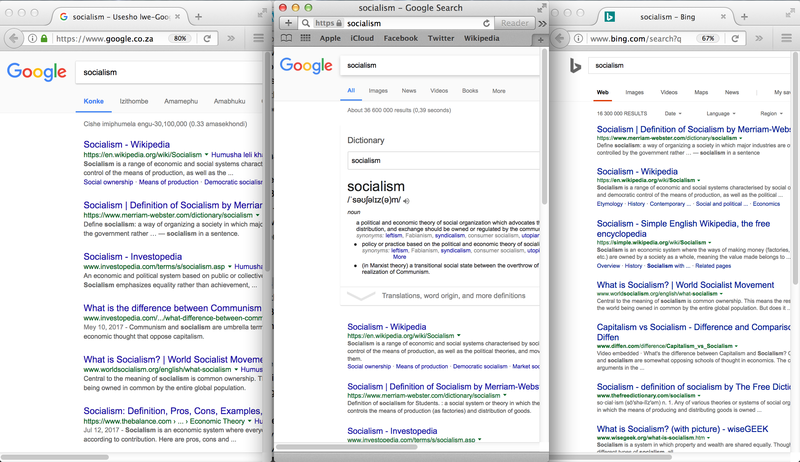 Then the set of searches of which the results are roughly the same. 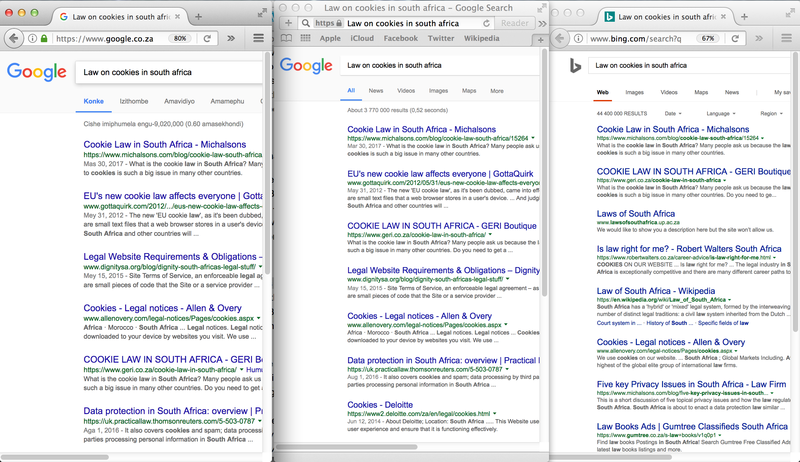 I had expected this for “Law on cookies in South Africa” and “Socialism”, for they were about the same last year as well. 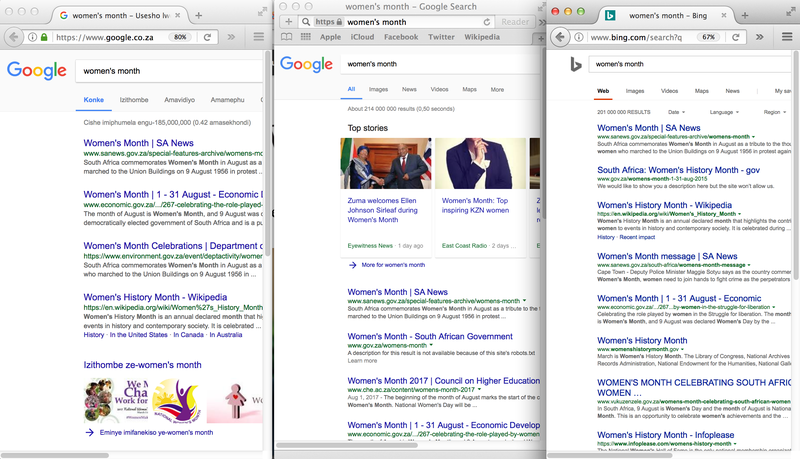 I wasn’t sure about “women’s month” (this month, August), given its history; there are slight differences, but not much. 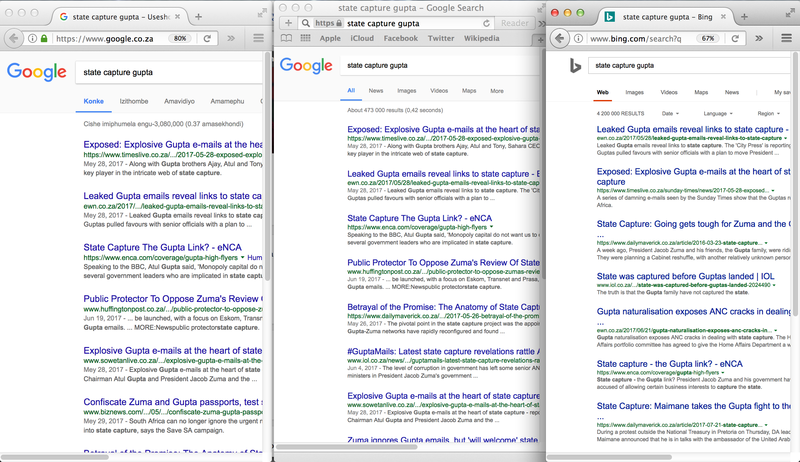 The interesting one, perhaps, was that “state capture gupta” also showed similar results across the three configurations, all of them showing results to pages that treat it as fact and at least some detailed background reading on it. Finally, last year the mini-experiment was motivated by lecture preparations for the “Social Issues and Professional Practice” block of CSC1016S that I’m scheduled to teach in the upcoming semester (if there won’t be protests, that is). As compared to last year, now I can also add a note on the Algorithmic Transparency and Accountability statement from the ACM, in addition to the ‘filter bubble’ and ‘search engine manipulation’ items. Maybe I should cook up an exercise for the students so we can get data rather still being in the realm of anecdotes with my 20 searches and three configurations. If you did the same with a different configuration, please let me know.